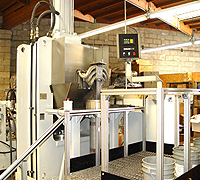 What are some ideal applications for abrasive flow deburring in Irvine CA? Aerospace: When it comes to aerospace applications, precision is of the utmost importance. It makes sense to continue to use abrasive flow deburring in Irvine CA to finish all kinds of aerospace parts, as this highly precise method was actually invented for aerospace in the first place. Automotive Engines: Whether it is air or fuel flowing through the passages in an engine part, any turbulence is going to decrease efficiency. Using abrasive flow deburring in Irvine CA, we can reduce turbulence and increase flow up to 25 percent. This in turn encourages more complete combustion for better fuel efficiency, power, and performance.